While at the local Wal-Mart this past weekend, I told myself I wouldn’t stop by the candy aisle. That, of course, didn’t work out. 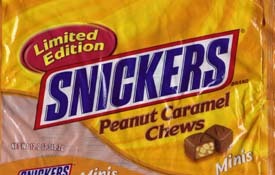 I’m glad it didn’t though, because I came across these brand new Limited Edition Snickers Peanut Caramel Chews. I didn’t see a mention of them on the Snickers website, so they must be pretty new. Costing less than $3, they were in a 12 ounce bag of “Mini” sized Snickers. I looked around and didn’t see them in any other sizes, so they may only be available this way. The chews themselves are very good. I like them quite a bit in fact. The caramel that they used is very sweet, making them taste very different from regular Snickers bars. Eating these reminds me of eating honey & peanut butter, if you threw in a little bit of chocolate. If you’re a fan of Snickers, or sweet caramel, definitely pick up a bag of these before they’re gone. I saw a coupon for these (and assorted mini Twix and 3 Musketeers) and I am now on a quest to find all 3 products. Too bad the Walmart near me is awful… but maybe they’ll have them at Target. Hey, those sound good! Kind of like the Goldenberg’s Peanut Chews, but with real milk chocolate. I would like to know where I can purchase Limited Edition Snickers Minis Peanut Caramel Chews. Eurgh, I don’t like Snickers anyway, aaaaaand isn’t there already peanuts and caramel in Snickers bars to begin with?